.. on the one hand, there are many choices for accessing and using local area labor force characteristics data; on the other, the available options often fall short of meeting the needs. This section provides a guide to accessing, integrating and using selected local area labor force characteristics data for wide-ranging analysis and decision-making applications. A “local area” as used here refers mainly to city/place, county and sub-county geography (census tract and ZIP Code area). See related Web section. The American Community Survey (ACS) 5-year estimates have evolved into a primary resource for examining labor force characteristics. One important limitation is the time lag between data availability and reference date. The ACS 2013 data (released December 2014) are for the 5-year period 2009-2013 and centric to mid-2011; in mid-2015 these estimates are 4 years old. However, these data can provide powerful insights. 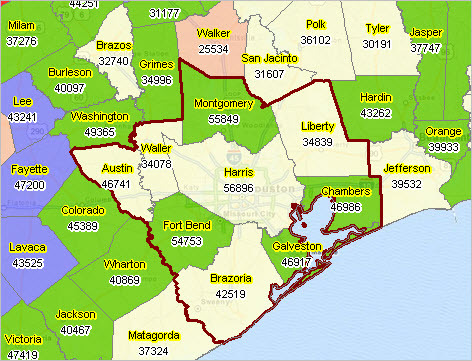 The following graphic shows the percent unemployed by ZIP Code area in the Houston, Texas/Harris County (bold black boundary) area. The ACS 2013 5-year estimates of the unemployment rate, included in the interactive table below, are shown as a thematic map. It is easy to see which areas/ZIP codes are experiencing higher/lower unemployment rates. Click for larger view; larger view shows mini-profile of ZIP Code 77077. 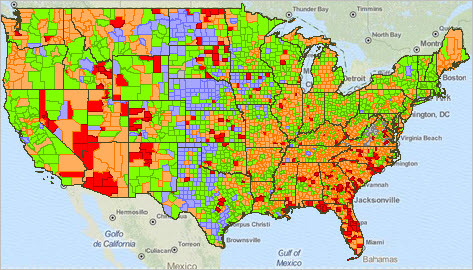 See more ZIP Code demographic-economic data resources. characteristics based on the American Community Survey 2013 5-year data. Advantages/disadvantages, strengths/weaknesses and more about accessing, integrating and using these data will be included in the mid-March update. BLS LAUS Program. Effective with the March 2015 release of the Bureau of Labor Statistics Local Area Unemployment Statistics (LAUS) estimates for metropolitan areas and smaller geography, new data and methodology are available for analyzing local area employment patterns. These new data have several far-reaching implications for local area labor force analysis. The fact that the new data are for the 2013 current vintage metropolitan areas CBSAs is very important. It makes the LAUS data consistent with CBSA geography used in other Federal statistical programs including the the American Community Survey (ACS). The new LAUS estimation methodology makes the local area employment and unemployment estimates more consistent with ACS data which are used in the LAUS estimation. Use of the annually updated ACS data in the LAUS estimates development is an important update to Census 2000-related data previously used in the estimation process. Other methodological changes should lead to more accurate and useful local area employment estimates for sub-county areas not otherwise available. Use the interactive table in the related Web section to view, rank, compare, query selected labor force characteristics by ZIP code area. These data are based on the ACS 2013 5 year estimates (same data as used in map view above). 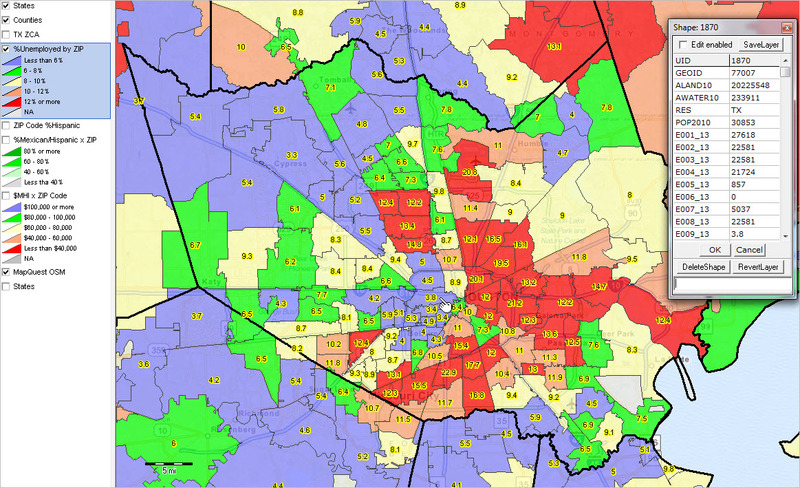 Houston area ZIP Code 77007 (shown at pointer in this view) has an ACS 2013 5-year estimated unemployment rate of 3.8%. 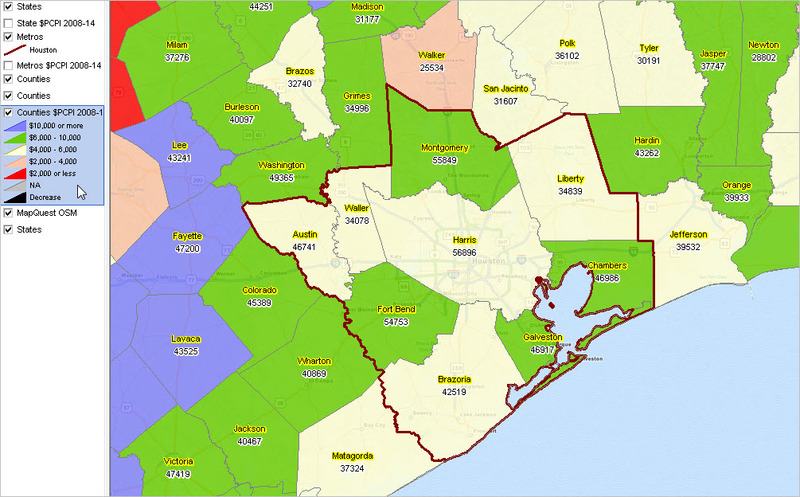 See ZIP code 77007 in context of all Texas ZIP code areas in the following graphic (click for larger view). Among all 1,934 Texas ZIP code areas, ZIP code 77007 is ranked 201 (there are 200 ZIP code areas with a lower unemployment rate). Use the interactive table to perform similar analyses on ZIP code areas of interest. See the main Local Area Labor Force Web section for mid-March updates (watch in calendar).